Through its eight editions, the Vendee Globe has grown in reputation to be the most extraordinary test of solo offshore racing. Combined with the IMOCA, an immensely powerful 60-foot class boat which now includes lifting foils, this non-stop around the world contest is legendary. But what isn’t legendary is the participation of women, but when the ninth edition in 2020-21 sets sail on November 8 from les Sables d’Olonne, France, that all looks to change. Clarisse Crémer (FRA), Sam Davies (GBR/FRA), Isabelle Joschke (FRA), Alexia Barrier (FRA), and Pip Hare (GBR) are progressing toward the start line which would make this female line-up an outright record in the race’s history. There have been seven women in eight editions, with six of them finishing the course. Women competing in the Vendée Globe always attract a lot of admiration and interest from the general public. While not many of them have taken part, those that have entered the event have always left their mark. In the first two editions of the Vendée Globe in 1989-90 and 1992-93, there were respectively 13 and 14 sailors, but no women. It was not until the 1996-97 race when two of them were in the field: Isabelle Autissier (ranked among the favourites) and Catherine Chabaud were the pioneers and led the way to diversity. Autissier finished outside of the race after carrying out a pit stop in Cape Town, while Chabaud became the first woman to complete a non-stop solo round the world race (in 6th place), after 140 days, 4 hours and 38 minutes at sea. Four years later came the arrival of Ellen MacArthur. The 24-year old British sailor was a sensation finishing second in the 2000 Vendée Globe, just 24 hours after the winner, Michel Desjoyeaux. On the other hand, on her second attempt, Chabaud was less successful, as her boat was dismasted. In 2004-05, two women lined up and completed the course – Anne Liardet 11th and Karen Leibovici 13th – when a third of the fleet could not. In 2008-2009, two more British women stood out, Sam Davies and Dee Caffari (finishing fourth and sixth). 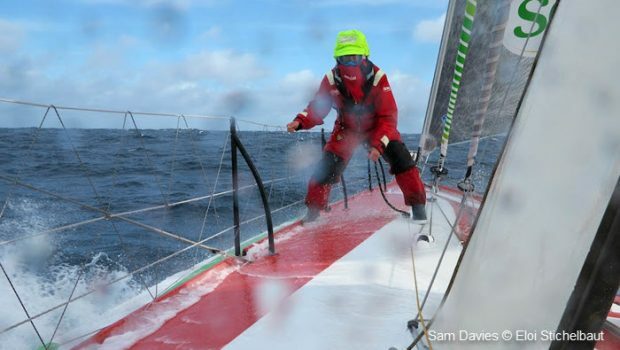 Sam returned in 2012, but her adventure came to a sudden end, when her boat was dismasted. But despite nearly a 100% success rate for women, the 2016-17 race had no women for the first time in twenty years. An anomaly, which surprised the public and did not reflect the reality of ocean racing, as women are present in many different circuits: Figaro, Mini 6.50, Class40, and the Volvo Ocean Race. For the crewed round the world race with stopovers, there was even an all women crew (Team SCA, skippered by Sam Davies) in the 2014-2015 race. There was no way a second Vendée Globe could occur without that essential female touch and very quickly projects began to take shape for 2020. Among the five women currently involved in IMOCA projects, only one has already taken part in the Vendée Globe (twice), Sam Davies. Highly experienced, determined and with a solid shore team, she will be setting off in 2020 aboard the foiler, Initiatives-Cœur, with some high ambitions and rightly so. Present in the IMOCA circuit since 2017, Isabelle Joschke is already a pair of safe hands in the class. She finished in eighth place in the 2017 Transat Jacques Vabre, 2nd in the Monaco Globe Series, and then the 2018 Dhream Cup with her VPLP-Verdier designed boat from 2007 (ex Safran). Now racing in the colors of MACSF, this skipper is committed to equality in ocean racing and more generally in every area of society. A journalist and sailor, with in particular experience in Class40, the British skipper Pip Hare bought the former Superbigou, an IMOCA with a long history that was built by Bernard Stamm and initially launched almost twenty years ago. Pip Hare had her first trips on her new boat in January. Alexia Barrier also sails aboard a famous, vintage IMOCA, a Lombard design from 1998 built by Catherine Chabaud with the 2000-2001 Vendée Globe in mind. Methodically getting to grips with her boat, Alexia completed the Route du Rhum in 15th position. The most recent candidate to be announced is Clarisse Crémer who will be racing in the colors of Banque Populaire. The young skipper finished 2nd in the 2017 Mini Transat and 14th in the 2018 Transat AG2R and is going to have to learn all about the former SMA, aboard which Paul Meilhat recently won the Route du Rhum. A huge challenge for Clarisse, who is being helped by Armel Le Cléac’h with whom she will compete in the Transat Jacques Vabre at the end of the year.